Book Review: Ellen Banda-Aaku's "Patchwork"
Patchwork is Zambian author Ellen Banda-Aaku's debut (adult) novel written in two parts. Part One, Lusaka, Zambia, 1978. 9 year old Pumpkin is living in Tudu Court, an apartment complex, with her mother, Totela. This part of the book details a time in Pumpkin's life when she is taken by her tata (father), a successful businessman, from her alcoholic mother to live with his wife, Mama T, and family. Part Two, Pumpkin is now 30-something, married with kids, but it seems that Pumpkin’s childhood years really did affect her. Here we see how being taken away to live with her father, and her father's actions and his different relationships, manifests. I'm going to be honest and say that Pumpkin wasn't likeable - both as a 9 year old and as a 30-something year old woman. I did sympathise with her situation - being the illegitimate daughter of a successful businessman, having an alcoholic mother, not fully ever belonging or feeling like she belonged, having to be moved from her home to live in an entirely new one - but Pumpkin wasn't the nicest person either. As a child, she was deceiteful and could be pretty nasty, while as an adult she was insecure, paranoid, emotional, pretty angry, still couldn't stop herself from lying, and had some serious trust issues (which is understandable, considereing her upbringing). Yes, Pumpkin was flawed, but really most characters in this novel were. Her mother for a time was consumed by love for a man that could never truly be hers. Her stepmother was cruel to a little girl who couldn't be blamed for her husband's actions (shouldn't she really have projected her anger on her husband and not a little girl?). Her father, as generous as he was financially, was still a womaniser, and while it was the right thing to do to openly accept and acknowledge his daughter, was it right of him to assume that his wife would accept her with arms wide open? 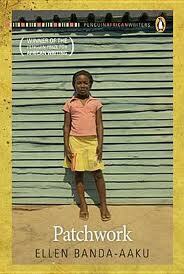 Patchwork was a beautifully written book and I really felt like I was there each step of the way - Tudu Court, her father's farm, Pumpkin at 9 playing with her friends, Pumpkin as an adult. More than that, it really did make me think. For one, was I terrible person for disliking Pumpkin as a child, but deeper than that, it made me think about the effect one's childhood, and their parents/family, could have on them. I thoroughly enjoyed reading Patchwork and would also like to say a big thank you to Penguin Books SA for sending me a copy to read and review. Interesting review, Thanks for posting this. You're welcome :). By the way, I love your blog. I checked out your blog - your challenge is so amazing. And I'm also glad you came across my blog. I'm also really looking forward to the rest of the books you read for your challenge.